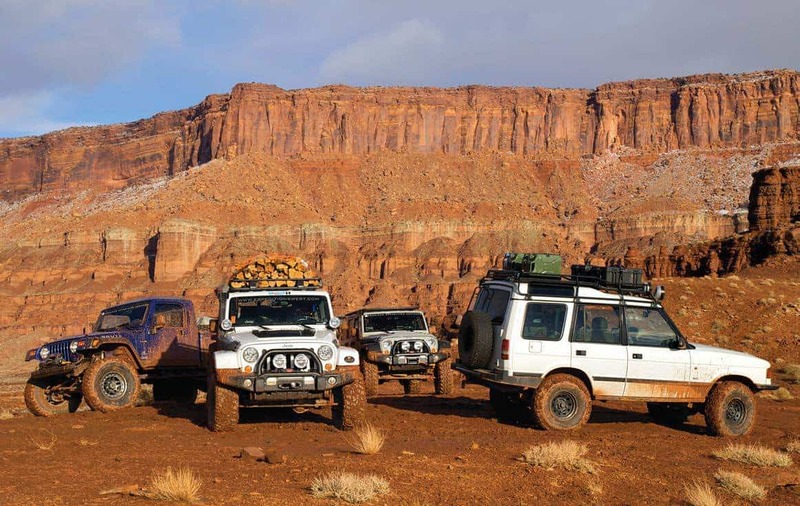 Editor’s note: The following article originally ran in the Gear issue of Overland Journal in 2012, and has been republished here in its original form. Please note that some aspects of the article may be out of date. Unfortunately, most of the products we encounter as consumers today are dishonest—they are faux. From Hummer H2s built on light-duty Chevy Tahoe chassis to chromed-out Harleys that are neither fast in a curve nor a straight line, many vehicles have favored the appearance of performance over delivery. Fortunately, there are still a few manufacturers that endeavor to make a vehicle look great and work great. In 2003, a few rogue engineers at Jeep spent their off time building the first Rubicon Wrangler concept; and ultimately put their jobs on the line to prove people would buy it. The Jeep marketing team estimated that only 3,000 Rubicons would be sold, and only for one year of production. When the model was announced, Jeep was overwhelmed with orders, exceeding the entire production estimation with preorders alone. The Rubicon was innovative, but most importantly it worked—really worked. Jeep’s Chief Designer Mark Allen is responsible for the elegant lines of the new Grand Cherokee and the purposeful nature of the new Wrangler. In 2008, Mark and his Skunkworks team decided on two significant endeavors for their show vehicles. 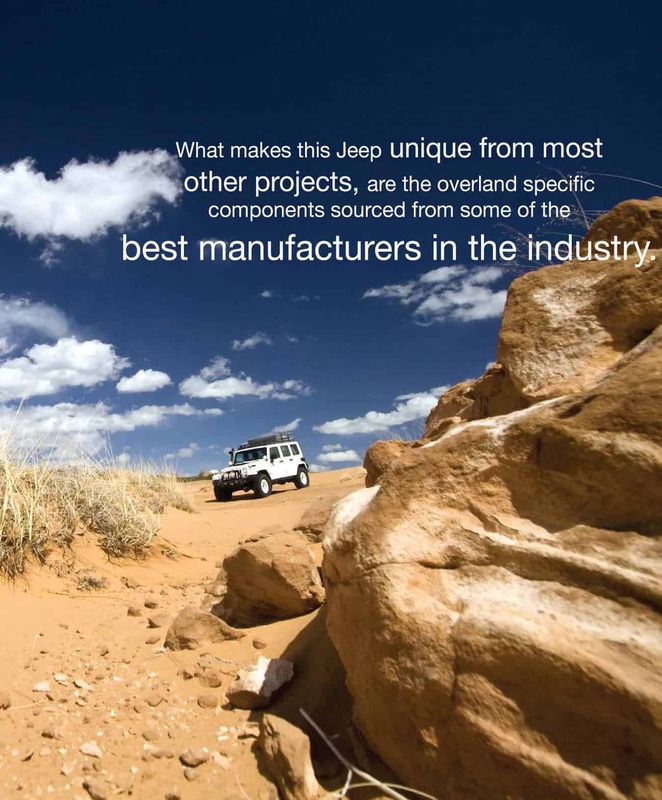 First, was that every vehicle must work on the trail and set a new standard in Jeep performance. 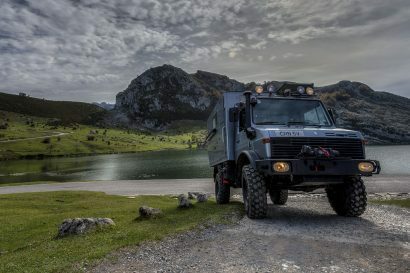 Second, to build a legitimate overland vehicle; something that could be packed with a few essentials and driven around the world. The result was the Overland JK. 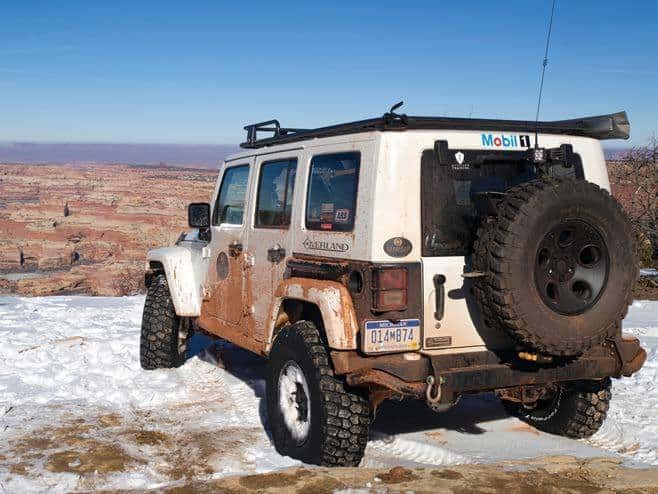 Unveiled at the 2008 Moab Easter Jeep Safari, it was ultimately featured in dozens of print publications and in a prime-time television show. 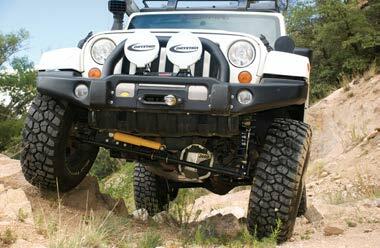 The Overland JK is based upon the Wrangler Rubicon Unlimited platform and then modified to support longer distance travel. Beginning at the chassis, the Jeep was fitted with an American Expedition Vehicles (AEV) 3.5-inch premium suspension system. This not only improved the ride, load capacity, and handling over the stock form, it also allows fitment of 35-inch tires. For tire and wheel selection, a set of BFGoodrich Mud Terrain KM2s was mounted on scrap spares from Grand Cherokees. The final chassis modification was the addition of a larger diameter rear anti-roll bar to accommodate the increased roof loads. 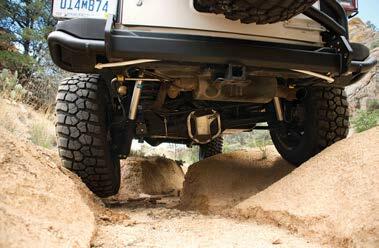 For protection on the trail and road, the Skunkworks team installed AEV front and rear bumpers, both suitable for serious impact (more on that later). Custom rear quarter panel protection was also installed, which features a rub rail just above the fender flare; this doubles as a handy step for accessing the roof rack or working to stow the roof tent. The Rubicon package already includes rocker panel protection, which was retained. What makes this Jeep unique from most other projects are the overland- specific components sourced from some of the best manufacturers in the industry. 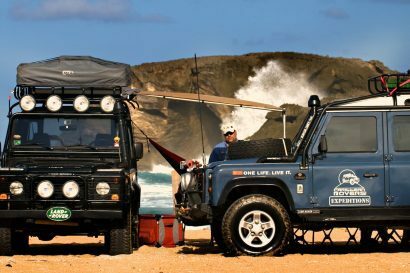 The roof rack is a steel unit from ARB, designed to accept a roof tent at the rear and also include a basket for equipment stowage in the front. The rack is through-bolted to the roll cage for additional strength using massive brackets. The roof tent is also from ARB, a 1.4-meter wide Simpson II model that includes a changing privy below. Deploying on the other side is a 2.2-meter ARB awning that is both lightweight and generous in coverage. For auxiliary lighting, a combination of Lightforce HIDs and Rigid LEDs were used. Moving to the inside, the rear seats were removed and a flat load floor was constructed. Access panels allowed for additional storage in the rear footwell. 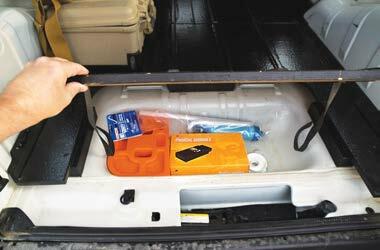 The original plastic center console was replaced with a lockable steel unit from Tuffy. This increased security and storage while improving driver comfort with a taller, padded armrest. Mopar covers were installed over the factory seats, along with Mopar rubber footwell liners. 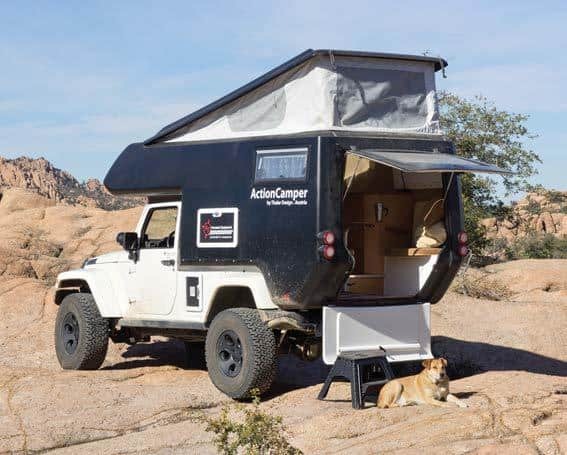 Fortunately for Overland Journal, Mark Allen and his team decided that Prescott should be the home of the Overland JK, and we took delivery of the Jeep in August of 2009. In the nearly three years we have used the vehicle, it has been a constant tool for our team. It’s been across Utah several times, throughout Arizona and across the United States, west to east and south to north TWICE. The Overland was also used in a prime-time television program (Dangerous Drives) where we busted snowdrifts for three full days. The modifications performed by Mark’s team have proven to be quite durable, certainly exceeding most expectations of what a show vehicle should do. We did receive an upgraded ARB tent along the way, which addressed several issues in the first version. The suspension was improved slightly with caster correction brackets from AEV. The bumpers have also proven to be exceptionally strong, with the front bumper being backed into and the rear bumper being hit in Phoenix by a cellphone-distracted teenager. The bumpers suffered no damage, while the other vehicles had thousands of dollars in repairs. Despite the near constant use, the Jeep has never failed to start, run, or get us where we wanted to go—no small feat given this Jeep’s abusive past. It is almost shocking to record the use history of this single Jeep Wrangler and the fact that it has proven to be 100 percent reliable. That is correct—not a single warranty repair, field repair or warning light. Sure, we have changed the oil a few times and replaced the rear brake pads, but not a single failure has occurred. Now why this is so impressive is that this particular Jeep is actually a 2007 model and was one of the first 60 vehicles to come off of the new production line in late 2006. It began its career on the Rubicon Trail, where it spent an entire summer shuttling journalists from around the world across this famous route. It is estimated that this Jeep traversed the Rubicon over 14 times in its first few months. Due to liability issues, early production fleet vehicles are normally crushed after their short but arduous lives as media cars. But somehow, this white Unlimited Rubicon survived the shredder and ended up at Superlift in Louisiana where it was used as a suspension test mule. The frame still shows the scars of long-arm kits and welded brackets. After a year with Superlift, it was brought back to Detroit and placed in the scrap yard, where it sat for a few months awaiting its appointment with death’s final blow. It was about this time when Mark Allen took a stroll down the death row lineup looking for his next project, the Overland. The little white JK was pardoned once again. After being moved to the Skunkworks facility, the humble Rubicon was transformed into the vehicle on these pages; modified and repainted, the chassis and drivetrain would remain original. 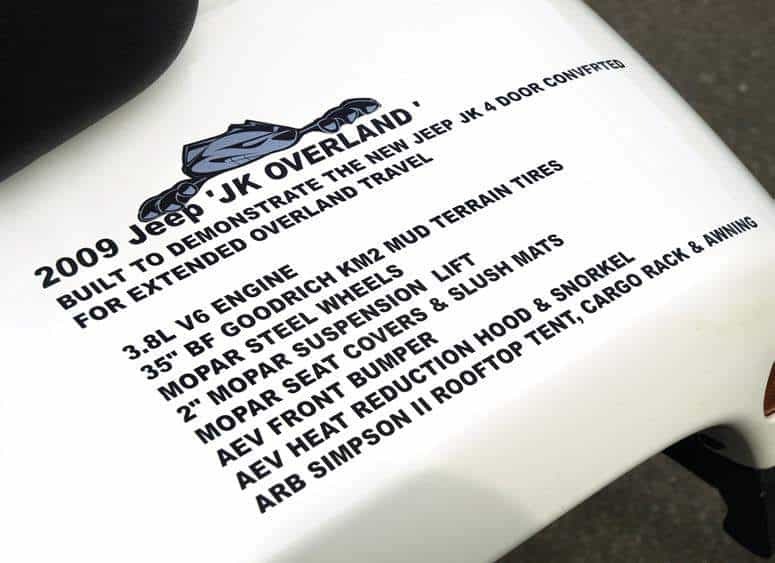 With modifications completed, the new Overland JK debuted again during Jeep’s gala presentation at the 2009 Easter Jeep Safari in Moab, Utah. Magazine editors from around the globe drove the vehicle hard during the week-long event, landing it in the pages of dozens of publications and even making the cover of Phil Howell’s magazine, 4WD & Sport Utility. 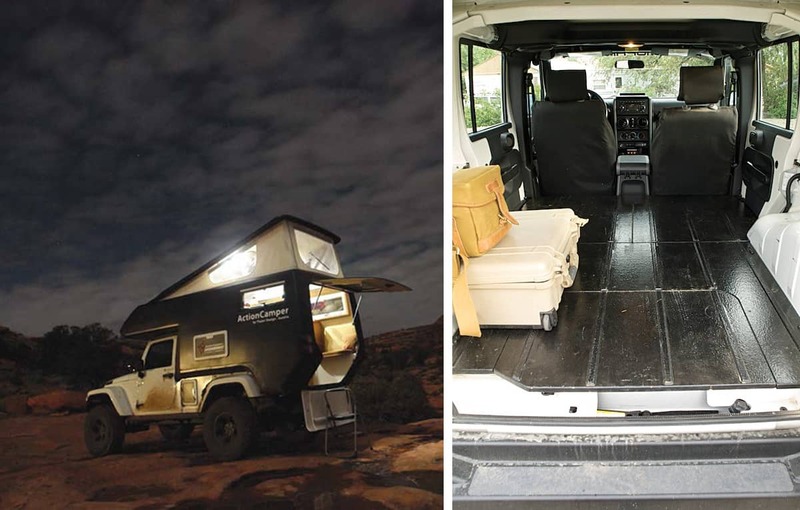 Surviving a thorough beating in Moab, the Overland was sent to Thor from Viking Offroad for product testing and photo shoots with Sinuhe Xavier. Fresh from the makeup artist at Viking, it was then delivered to Chris Collard (before he became our editor-in-chief) for the popular Border-to-Border article series featured in Four Wheeler and several international publications. During the trip with Chris, it was driven from the Mexican border to the Canadian border, mostly on dirt, again with no failures (save a sensor in the steering column). Chris and I both have tremendous respect for the Toyota brand and the quality of their four-wheel drives, but the performance and durability of this particular Wrangler had started to win our affection. Despite our admiration of the Overland, it was not without complaint or criticism, primarily focused on the 3.8-liter V6 and a 4-speed automatic transmission. The 6-speed manual would have been a better fit and more rewarding to the driver. We also found that all of the roof weight affected the Jeep’s ability to climb steep ledges and waterfalls, the rearward bias and light V6 engine causing dramatic wheel lifts from the front tires. This was easily fixed by removing the items from the roof. 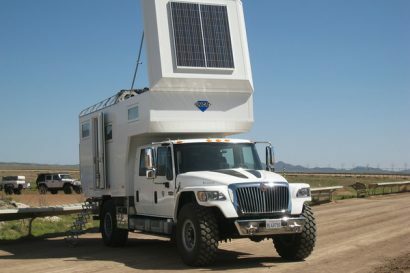 To make the project vehicle completely useable, we installed an ExtremeAire compressor, a fuse block and AGM battery, 17-inch AEV Savegre wheels, and a two-meter HAM radio. The Overland JK is useful and has been driven almost daily for everything from technical trail driving and training military teams to far more domestic duties. What makes the Jeep Rubicon Unlimited desirable is its broad range of capability, from the benign to the extreme. In a fitting end to its lifecycle, the Overland JK has been put into the service of development once more. The roll bar was cut off, the roof and doors removed, all to allow the fitment of an Austrian expedition camper, the Action- Camper. Then it was off to the SEMA show in Las Vegas, Nevada. 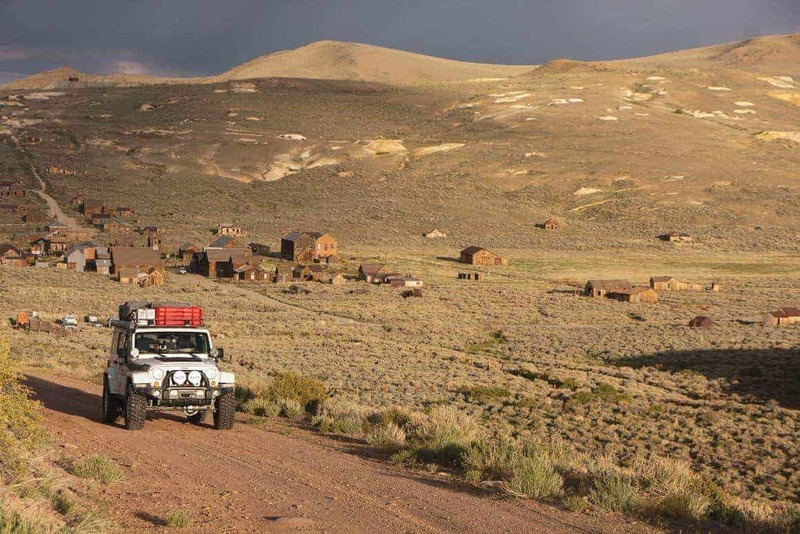 At the end of December, the Overland JK will make its final trip to Detroit. It has proven to be a faithful companion on many adventures. But most importantly, it is an honest product that performed a job well done. Editor’s note: I’ve yet to own a Jeep. But as Scott mentions, we’ve gained a personal affinity for the Overland JK during the past few years. If I were to buy a rig with a seven-slot grille, it would be a JK much like the Overland. It is sad for me to see this iconic representation of American inspiration and overlanding prowess sent to the crusher—it’s like losing an old friend. I feel a better resting place might be the Jeep historical collection managed by Jeep guru Brandt Rosenbusch.